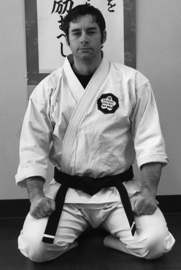 Mr Oliver began his Ketsugo Goju-Ryu training with Shodai Jay Trombley in 2002. After watching a two-day black belt test he signed up the next week. It was a demonstration of Sanchin kata, the central kata of Goju-Ryu, that impressed him the most. Training in all aspects of Ketsugo Goju-Ryu, Hanshi particularly enjoys working with traditional Okinawa weapons: bo, sai, tonfa, nunchaku, and kama. Instructing is an active part of training and Hanshi enjoys helping students understand the mental focus as well as physical aspects of karate. He feels that teaching karate allows one to continue a rich and traditional art form and is a testament to one's own instructors. In June of 2012, Mr Oliver opened his own dojo, Oliver Karate Academy in Bedford Texas. Upon the retirement of his instructor, on October 6, 2016 Shodai Jay Trombley promoted Mr Oliver to 9th Dan and successor of the Ketsugo Goju-Ryu karate system. Mr Griffin began his karate training under Shodai Jay Trombley in January 1980. In 1990, Renshi Griffin was the first Ketsugo Goju-Ryu student to receive the rank of Sandan. During his early karate training, he competed at numerous tournaments as both a junior and adult. He won many titles and awards, including the TKL men's division in 1992. Renshi is particularly fond of teaching; he enjoys seeing students transition from beginners to skilled karateka. In his training, Renshi devotes special attention to the performing of Goju-Ryu kata, and his diligence in this is evident. Outside of the dojo, Mr Griffin has had a long and successful career as a firefighter. He has drawn upon his karate training (both physical and mental) to perform at the level required in this profession. Renshi Griffin is proud to be a part of the tradition of Ketsugo Goju-Ryu Karate, a tradition he hopes to promote for many more years. Mrs Oliver began her training in Ketsugo Goju-Ryu with Shodai Jay Trombley as a young girl in the 1980's. She represented the system at numerous tournaments as a junior rank, bringing home many trophies for kata and sparring. Much of her success - inside the dojo and out, both personally and professionally - she attributes to her strong martial arts background. Sensei takes pride in the opportunity to instruct new students in the art that shaped her life. She spent 11 years teaching middle school math at a local Catholic school, and her evenings teaching both children and adults self-defense, passing on the lessons of discipline, respect, and fitness that changed her life over twenty years ago. 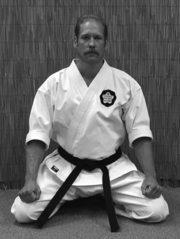 Mr Knudson first began training under Shodai Jay Trombley in 1988 at the age of 5. He trained diligently over the next 10 years during which time he is proud to have been one of the few to earn the rank of Jr. Black Belt. Having left the dojo as a teenager, the spirit, training, and lessons of the dojo were never far from his thoughts. In January 2010 Sensei Knudson found his way back to Ketsugo Goju-Ryu and resumed his training under Shodai. 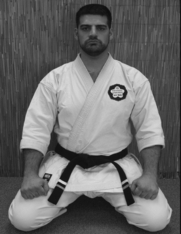 Drawing from his prior training and a rekindled passion for karate he quickly advanced back through the ranks and earned his senior Shodan in September 2012, and Nidan in April 2014. 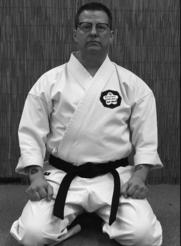 Mr Bryant received his Shodan on November 17th, 2018. Bio coming soon! 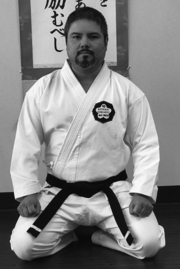 Mr Navarro received his Shodan on November 17th, 2018. Bio coming soon!